Hanumath Chamathkara Sthuthi is a powerful sloka praising Hanuman. Reciting this sloka is extremely beneficial before proceeding to exam, interview, for success in litigations, overcoming negative energies etc. Most of the stanzas address every type of negative force, dhur devata, jealousy, black magic, tantra and every possible malady. This sloka is a powerful kavacha for all types of negative and inimical forces that we encounter. Reciting this sloka on Tuesday, Thursday and Saturday is extremely beneficial. Lord Ganesa and Lord Hanuman's devotees are the only ones who Lord Saturn would studiously avoid. Get a photo of Lord Hanuman in which his eyes are clearly visible and you can look at the photo eye-to-eye. 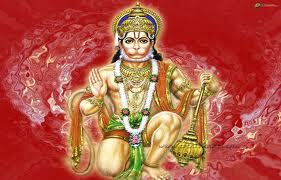 Look at Lord Hanuman straight in the eye while you recite it. Who as a child try to catch the globe of Sun, Who made Akshaya Kumara(son of Ravana) in to a paste , Who broke up the group of people guarding the forest , Who flew up from the Drona mountain, Who obeyed properly the words of his master , Who joined in the group war , Who had a beaming regal voice. Dasa greva shira krunthakaya, Kumbha karnadhi vadha karanaya, Bali nirvahana karanaya , Megha nadha homa vidhwamsanaya , Indra jit vada karanaya , Sarva shasthra paramgathaya , Sarva graha vinasakaya , SArva jwara haraya, Sarva bhaya nivaranaya, Sarva kashta nivaranaya, SArva aapathi nivaranaya, Sarva dushathdhi nibarhanaya , Sarva shathru chedhanaya, Bhootha pretha pisacha, dakini sakini dwamsakaya, sarva karya sadhakaya, Prani mathra rakshakaya, Rama dhoothaya swaha. Who made the ten heads of Ravana bend , Who is the cause of the death of Kumbha karna and others, Who was the cause for managing Bali, Who was the one who destroyed the yaga of Indra jit, Who was the cause of death of Indra jit, Who was an expert in all Sasthras, Who destroyed all houses, who cured all fevers, who is the antidote to all fears, Who solved all problems, Who saved us from all dangers, Who punished all bad people , who killed all enemies, Who killed Bhoothas, prethas , ghosts , dakinis and Sakinis, Who could achieve all actions, who saved all beings, and who is the emissary of Rama, Swaha. 2.Om namo hanumathe , rudhravatharaya , viswa roopaya , amitha vikramaya, prakata parakramaya, maha balaya, soorya koti sama prabhaya, Rama dhoothaya swaha. 3.Om namo hanumathe , rudhravatharaya , Rama sevakaya, Rama bhakthi thathparaya, Rama hrudhayaya, Lakshmana Shakthi bedha nivaranaya, Lakshmana rakshakaya , Dushta nibarhanaya , Rama Dhoothaya swaha. Om Salutations to Hanuman, who is the incarnation of Rudhra, who is the servant of Rama, Who is only interested in devotion to Rama, Who is the heart of Rama, Who saved Lakshmana from the efeect of Shakthi, Who saved Lakshmana, who killed bad people , who is the emissary of Rama. 4.Om namo hanumathe , rudhravatharaya , Sarva shathru samharanaya, sarva roga haraya, sarva vaseekaranya, Rama dhoothya swaha. Om Salutations to Hanuman, who is the incarnation of Rudhra, who exterminates all enemies, who cures all diseases, who attracts everything , Who is the emissary of Rama, swaha. 5.Om namo hanumathe , rudhravatharaya , aadhyathmikadhi bouthika thapa thraya nivaranata, Rama dhoothya swaha. 16.Om namo hanumathe , rudhravatharaya , sarva grahana , bhootha bhavishya , varthamaanan , sameepa sthana sarva kala drushta , budhin uchadyouchadaya , para balani , kshobhaya kshobhaya , mama sarva karyani sadhaya sadhaya swaha. Om Salutations to Hanuman, who is the incarnation of Rudhra,chant and chant about all planets, the past, present and future , near by places and the wisdom to see everything beyond time, raise raise the divine strength and fulfill, fulfill al my wishes, swaha. 17.Om namo hanumathe , rudhravatharaya , para krutha yanthra , manthra parahamkara , bhootha pretha pisacha para drushti sarva vighna tharjana chetaka vidhya sarva graha bhayam nivaraya nivaraya swaha. Om Salutations to Hanuman, who is the incarnation of Rudhra,,please help me to find cures for the yanthras and mantras sent by others, the ghosts and dead souls sent by those egoistic ones, the blockages arising due to evil sight of others , evil knowledge gained and fear of planets, swaha. Om Salutations to Hanuman, who is the incarnation of Rudhra,, cure , cure the fear for dakini, sakini, brahma rakshas , and the clan of ghosts , swaha. 19. Om namo hanumathe , rudhravatharaya , Bhootha jwara , pretha jwara , charthurthika jwara, vishnu jwara mahesa jwara , nivaraya, nivaraya, swaha. Om Salutations to Hanuman, who is the incarnation of Rudhra,, cure , cure the fever caused by ghosts ., the fever caused by dead souls , the fever caused by the fourth type , fever caused Vishnu, fever caused by Mahesa . 20. Om namo hanumathe , rudhravatharaya , Akshi shoola , paksha shoola , sirobhyanthara shoola , pitha shoola Brahma rakshasa shoola kula vhedanam,,nivaraya nivaraya swaha. Om Salutations to Hanuman, who is the incarnation of Rudhra,, Cure cure pain in the eye , pain on one side, pain in and out of the head , pain due to phlegm , pain due to Brahama Rakshas.